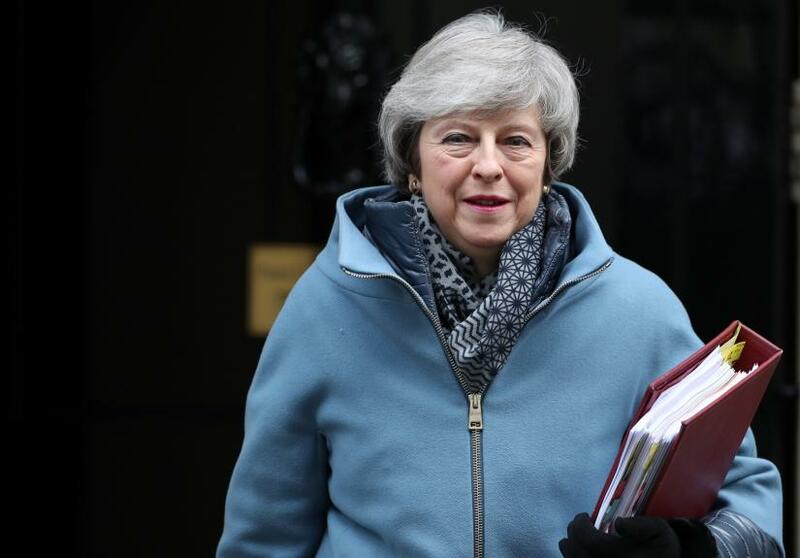 British Prime Minister Theresa May returns to parliament on Thursday to seek renewed backing for her plan to renegotiate her Brexit deal with Brussels, just weeks before the March 29 leave date and amid warnings over the risk of a disorderly exit. While Thursday's vote is symbolic, it could again become the focus for increasing frustration in parliament over her strategy to leave the European Union, with many accusing May of running down the clock. If parliament does not ultimately approve a deal, under current legislation Britain will leave without an agreement, an outcome many businesses say would be catastrophic for the world's fifth largest economy by causing major delays at ports, fracturing international supply chains and hindering investment. So far, parliament has backed May in asking for more time and supported her attempt to secure changes to the divorce deal, specifically on the so-called backstop arrangement to prevent a return of border controls between Northern Ireland and Ireland. But lawmakers are increasingly concerned that as the departure date gets closer, Britain risks leaving without a deal or being faced with a stark choice - back May's deal, force a no-deal Brexit or have no Brexit at all. Comments by May's chief Brexit negotiator, Olly Robbins, overheard by an ITV correspondent at a hotel bar in Brussels have done little to boost trust among lawmakers. He was reported as saying lawmakers would have to choose whether to accept a reworked Brexit deal or a potentially significant delay. In parliament on Wednesday, May sought to play down the significance of those comments when asked about them by one of her lawmakers, saying her government's strategy of leaving with a deal on March 29 had not changed. "I am grateful that he has asked me that question rather than relying on what someone said to someone else as overheard by someone else in a bar, it is very clear the government’s position is the same," she said. "We triggered Article 50 (the process for leaving the EU) ... that had a two year timeline, that ends on 29th March. We want to leave with a deal and that is what we are working for." But trust in the prime minister is at a low, and lawmakers are looking at ways of reducing the risk of a no deal. Several will try to get parliament to back their alternative proposals on Thursday, with options including calling a second referendum, a delay to Brexit, votes on a range of options and even a push to reverse the decision to leave the EU. None are expected to win enough support to pass, with lawmakers who are seeking to force the government to delay Brexit saying they will wait until the next round of votes May has promised on Feb. 27 to make their move. Pro-Brexit campaigners in her Conservative Party are threatening to vote against their government in protest however, a move that would weaken May's argument to the EU that she can win a vote in parliament if Brussels agrees to change the deal. The focus of many of the pro-Brexit lawmakers is the motion the government will put forward on Thursday, which some suggest takes a no deal scenario off the table. But a spokesman for May said: "What the motion reflects is ... that parliament wants the UK to leave with a deal, that in order to do so it requires us to secure legally binding changes in relation to the backstop." "The motion reflects the fact that that work is ongoing." May has repeatedly said Britain will leave on schedule, with or without a deal, as she tries to get the EU to reopen the divorce agreement she reached in November. But her chief Brexit negotiator Robbins was overheard saying lawmakers would have to choose whether to accept a reworked Brexit deal or a potentially significant delay. "Got to make them believe that the week beginning end of March ... Extension is possible but if they don’t vote for the deal then the extension is a long one," ITV quoted Robbins as saying in the hotel bar on Monday during a private conversation. Robbins made clear that he felt the fear of a long extension to Article 50 might focus lawmakers' minds, ITV said. The spectacle of one of May's most senior officials undermining her negotiating position in a hotel bar in Brussels indicates the scale of the United Kingdom's Brexit crisis that has shocked both investors and allies. Amid the labyrinthine plots and counterplots of Brexit, the United Kingdom's most significant political and economic move since World War Two, some major investors, such as Ford Motor Co , are trying to work out whether to shutter UK production. According to economists polled by Reuters, Britain's economy will barely grow in the run-up to Brexit but if there is a deal there will be a modest post-divorce upturn. But Irish Prime Minister Leo Varadkar said he believed the EU would strike a deal, even as Dublin continued its preparations for all outcomes, including a no deal.